Turning a light on in your home probably doesn’t elicit much thought about the amazing systems and processes that provide your electricity. The electric grid has the capability to supply nearly every American with the power they need, from charging phones to keeping homes cool on hot days, at a moment’s notice. Electricity flows at the speed of light, so the amount that’s being produced by generators must match the amount being used by customers at every instant. Demand for power is not constant throughout the day. Utilities must manage multiple power plants to ensure you are receiving a reliable supply of power. A growing portion of our energy supply is from renewable wind and solar. Because there are no labor and fuel costs associated with renewable energy, renewables will be the cheapest resource when they are available. But, the wind may not be blowing or the sun may not be shining during times when demand is highest. What tools exist for utilities to address these factors? Demand-side management is a strategy that can be used remedy many of the issues listed. Demand-side management (DSM) programs encourage customers to reduce their energy use when energy demand (and consequently energy prices) are highest, and/or shift their usage to times when cheap, renewable energy is plentiful on the grid. Each of these programs help reduce the need for new power generators. Energy efficiency investments allow each unit of electricity to be used more efficiently, lowering demand throughout the day. Time-variant pricing such as time-of-use rates, better align electricity prices with the cost of generation. This means during times of high demand, the price will be higher. Customers are incentivized to use less during those times, and to use more when demand is low and electricity is cheap. 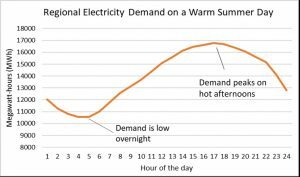 Finally, demand response programs provide financial incentives to reduce energy usage during periods of peak demand if the utility calls an event. For example, a utility could pay customers to reduce their usage on a hot summer afternoon. Demand-side management programs can benefit customers – both those who participate in the programs and those who do not. Participating customers benefit by spending less money on electricity bills. Non-participating customers can save money, too, because the programs shift electricity usage away from times where demand is highest to times when energy is cheapest (e.g. when the wind is blowing). This reduces the need to build new power plants and limits our reliance on the expensive fossil-fuel “peaker” power plants currently in service. Finally, demand-side management can benefit the environment by increasing the use of renewable energy when it is available and reduce fossil fuel usage. Many customers with electricity-intense processes (think large industrial and manufacturing organizations) currently use the demand-side management programs described above. Businesses invest in the most energy-efficient equipment to reduce their operating costs. They often participate in demand response programs, too, cutting usage when they get the signal from their utility in exchange for reduced electric rates. Residential customers also participate in demand-side management. Many utilities offer programs to briefly cycle off customers’ air conditioners when demand is high, or heat up their electric water heaters overnight when demand is low. Residential customers of most utilities have access to energy-efficiency programs, too. There is a lot of additional opportunity for demand side management to benefit our energy system and save consumers money. Household appliances are continuously becoming more energy efficient and reduce overall demand for energy throughout the day. Electric vehicles, smart thermostats, and smart water heaters offer new capabilities to automatically coordinate with time-of-use rates. This has not yet come to Minnesota, but in some parts of the country, customers can participate in demand response programs where they get alerts and get financial rewards for reducing energy consumption. We’re excited to share new, existing, and future opportunities related to demand-side management. Look for future blogs on these topics in the upcoming weeks.